Summary: A 31-year-old male patient presented with progressive mixed hearing loss since birth. A stapedectomy was attempted and was unsuccessful because of perilymph gushing. CT of the temporal bones showed bulbous dilatation of the fundi of the internal auditory canals and absence of the bone plates separating them from the base of the cochleas. This unusual abnormality was found after the attempted stapedectomy and explains the clinical findings. The findings in male patients are fairly typical X-linked congenital deafness. In male patients, the combination of congenital mixed hearing loss and stapes gusher is a distinct defect suggesting an X-linked pattern of inheritance. This is a rare disorder that is infrequently encountered in clinical practice. Preoperative recognition of this entity plays an important role in the identification of patients at risk for perilymphatic stapes gushing and avoids worsening of sensorineural hearing loss. Gushing occurs because the absence of bone at the base of cochlea allows for communication between the CSF in the internal auditory canal and perilymph. We describe the imaging findings in a patient with hearing loss who underwent stapedectomy and developed perilymph gushing at surgery. A 31-year-old male patient presented with a history of progressive mixed hearing loss since childhood. The patient had worn hearing aids since then. Before referral to our hospital, a stapedectomy was attempted, but, upon perforating the footplate, perilymph gushing was observed. The perilymph leak was controlled, and reconstruction was not attempted. He subsequently wore hearing aids for a number of years with adequate results, but eventually he was referred to our institution for further management of his profound hearing loss. Physical examination showed bilateral negative Rine tests by using the 512-Hz tuning fork. Audiometric testing showed bilateral mixed hearing loss with speech recognition thresholds of 90 and 95 dB and discrimination scores of 72% and 76% in the right and left ears, respectively. He had substantial bilateral air-bone gaps. CT of the temporal bones, obtained by using 1-mm-thick axial and coronal sections with a prospective high-resolution bone filter, showed bulbous dilatation of the fundi of internal auditory canals. The bone plates separating the basal turn of the cochleas and the internal auditory canals were absent bilaterally. (Fig 1) The labyrinthine segments of the facial nerve canals also appeared enlarged bilaterally. The modiolus was not seen on either side. The vestibular aqueducts were of normal size, and the semicircular canals and vestibules were completely developed. The middle ear cavity and the ossicles were normal. Despite the absence of a familial history of deafness, in view of the clinical history and the imaging findings, diagnosis of X-linked congenital hearing loss was established. The patient continues to use amplification devices. X-linked congenital deafness. A, Axial CT section (1 mm thick) of the right temporal bone shows a wide IAC. There is absence of bone (arrowhead) at the base of the cochlea allowing it to communicate with the IAC. The cochlea is dysplastic and the modiolus not well seen. B, On the same side, the labyrinthic portion (arrowhead) of the facial nerve is wide. C, Axial CT section of the left temporal bone also shows a wide IAC communicating (arrowhead) with the basal turn of the cochlea. The cochlea is dysplastic, and the modiolus not well seen. Congenital X-linked mixed hearing loss is now a well-recognized, albeit rare, clinical syndrome. Most of the reported cases appear in the clinical literature, and thus some radiologists may not be entirely familiar with this entity. Recognition of congenital X-linked mixed hearing loss is important because it changes the treatment and precludes stapedectomy. Nance et al (1) established that the X-linked transmission of congenital mixed hearing loss is associated with a fixed stapes footplate and perilymph gushing during attempted stapedectomy. Wallis et al (2) localized X-linked mixed deafness to Xq 13-q21.1 region. The first and the largest case series describing the CT features of congenital X-linked mixed hearing loss was published by Phleps et al (3). Imaging features of X-linked deafness across seven pedigrees were reported. Sixteen of 24 affected male patients were found to have bulbous internal auditory canals and incomplete separation of basal turn of cochleas from the fundi of the internal auditory canals. Widened first and second parts of intratemporal facial nerve canals were also seen. These findings were bilateral. Some of the obligate female carriers had milder forms of the same anomaly associated with milder hearing loss. Curiously, some of the deaf male patients had normal inner ear anatomy and thus might have had a different locus on the X chromosome. Similar CT findings were described by Talbot and Wilson and Tang and Parnes (4, 5). Talbot and Wilson described four patients with congenital X-linked deafness. In addition to the typically enlarged internal auditory canals, hypoplasia of the base of the cochleas, and enlarged labyrinthine facial nerve canals, they described absence of bony modioli and abnormal vestibular aqueducts in all four patients (4). Tang and Parnes (5) described two patients with widening of fundi of the internal auditory canals and absent bony partitions between them and the basal turn of cochleas. Papadaki et al (6) reported two cases of X-linked deafness with stapes gusher in females with normal male relatives. Bulbous dilatation of the fundi of the internal auditory canals, incomplete separation of them from the base of the cochleas, and widened facial nerve canals were seen in both female patients. The authors postulated autosomal recessive inheritance with low gonidial penetration or nonrandom inactivation of a normal gene favoring a mutation in the X gene. The imaging features of all the cases reported in the English literature (to the best of our knowledge) are summarized in the Table. 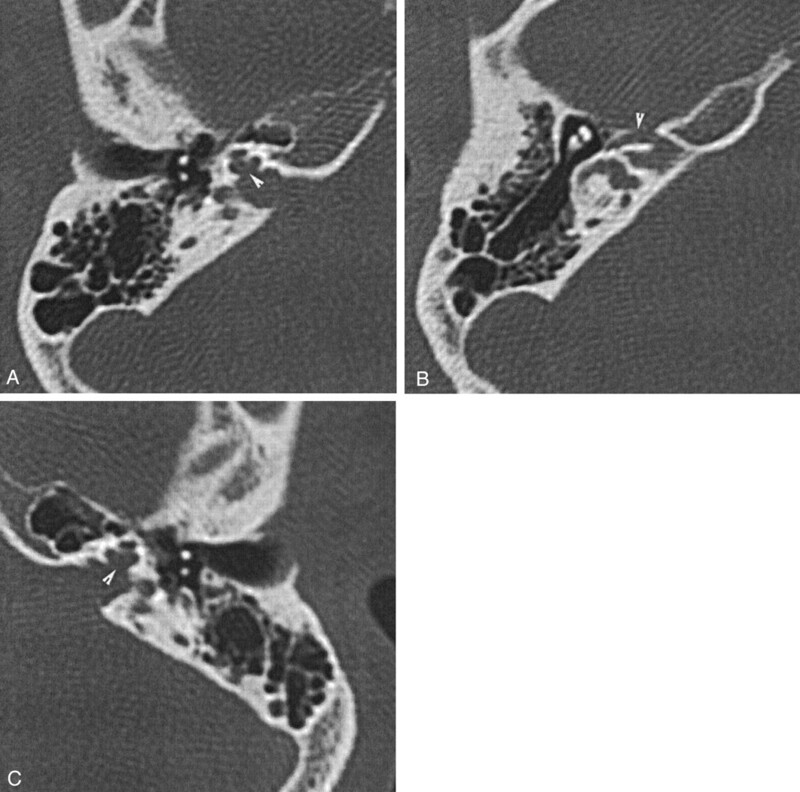 In our patient, CT showed a bulbous dilatation of the fundi of the internal auditory canals. Occasionally, this finding is a normal variation, but it should be considered abnormal when the lamina cribrosa separating the internal auditory canals and the basal turn of cochlea are very thin or deficient (3). The laminae cribosa were not seen in our patient. Widening of the labyrinthine segment of facial nerve canal is also explained by the deficiency of bone in that region and was present bilaterally in our patient. A medial origin of the vestibular aqueduct with varying degree of dilatation as described by Talbot et al was not seen in our patient and has not been reported in any other patients either. Enlarged vestibular aqueduct is also associated with deficiencies in the modiolus (7, 8). Accompanying abnormalities involving the internal auditory canal and the facial nerve canal have not been described. A clear association between an X-linked stapes gusher and a large vestibular aqueduct remains to be established. Occurrence of the large vestibular aqueduct is usually sporadic and has a female predominance. Familial inheritance as an autosomal recessive trait has been described elsewhere (5, 6). This abnormality may be due to increased pressure in the aqueduct transmitted through the perilymph when the lamina cribrosa is absent. The increased perilymph pressure may be a cause of stapes footplate fixation, and thus, conductive deafness as well as progressive cochlear nerve dysfunction affecting the sensorineural component of hearing. The increased transmitted pressure in the perilymph is also responsible for gushing during stapes manipulation (5, 6). The CT and clinical findings are considered typical, and a family history need not be present to suggest the diagnosis of X-linked congenital hearing loss. In four patients reported by Talbot and Wilson (4), a family history was not present. Of the cases described by Phleps et al (3), 16 of 24 had a family history. Recognition of these findings should alert the physician to review the family history carefully to avoid potential treatment complications in relatives with hearing loss. In the absence of corroborative family history, diagnosis of X-linked congenital deafness should be entertained in those patients with the typical imaging findings. Regarding treatment of patients with stapes gusher, the first step is to avoid surgery in those with only conductive hearing loss. Conductive hearing loss may be treated with external hearing aids. If the patients have profound sensironeural hearing loss, cochlear implantation is a viable option. During surgery, a stapes gusher may develop but may be controlled with a patch. Because there is a risk of advancing the electrode into the internal auditory canal, postoperative confirmation of its position first with radiographs and, if needed, afterward with CT may be indicated. Accepted after revision October 31, 2002.